When the only horses you have met are riding school horses and for-hire ponies, you get a very skewed picture of what a horse is like. You look at things like height, color, and how well they move. What a pleasant surprise to find out that horses are so much more than something you get on and ride. It’s not just in books and movies where horses are full of character. The two in my paddock are full of personality! I am discovering so many new things about them. 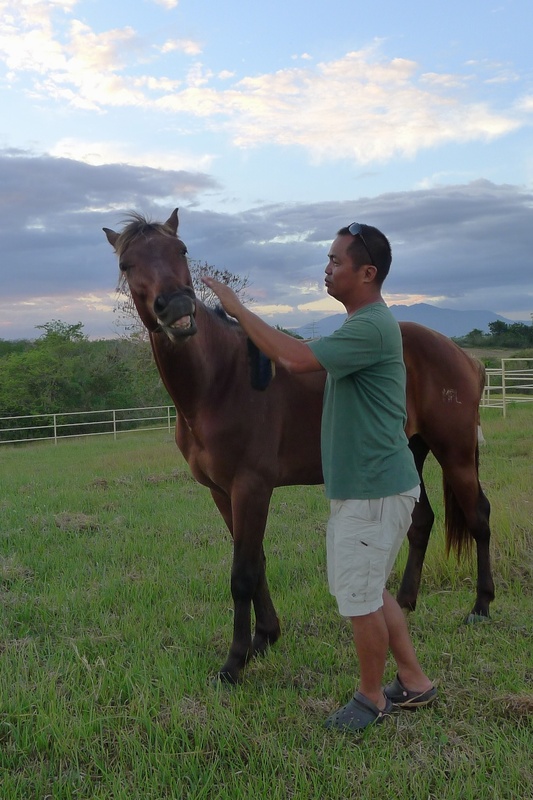 TAKOY started off as a cattle horse in a big ranch. When he retired, he was moved to a smaller training ranch. He was the “Big Boss” there. He’s easy-going and dependable and and was the horse given to children learn on. He was recommended to us because he’s “bomb-proof”. He’s trained, his personality is set, and he doesn’t need much attention. He’s a tough horse. I was told that he might laugh at me if I tried to shampoo and brush him. He’s supposed to be the husband’s riding horse. I thought he would be aloof or maybe even condescending since we are rank beginners at horse care. He was used to real cattle-wrangling cowboys! It turns out that Takoy is very friendly and affectionate. He likes being brushed. He nuzzles my hair. Takoy is a big nuzzler! BATMAN is my riding horse, and something of a project. He was recommended to me in case I wanted a horse that was a bit more challenging than Takoy, yet not too challenging. I was told that since he was gelded young, he has the sweet disposition of a Labrador Retriever! But since he’s young, only 3 years old, he is also more playful, spunky and a little needy. Batman is the one who walks up to us as soon as he sees us. In the early days though, he would walk up to us and then bite! He would also repeatedly taunt and challenge Takoy. He’s settled down a lot since I started doing the groundwork exercises. He seems a lot calmer now. He also seems eager and willing to learn. A very toothy photo from the early days. On the downside, horses can get pushy and disrespectful in a short time. I was warned beforehand “don’t forget they’re horses” and “don’t treat them like pets”. 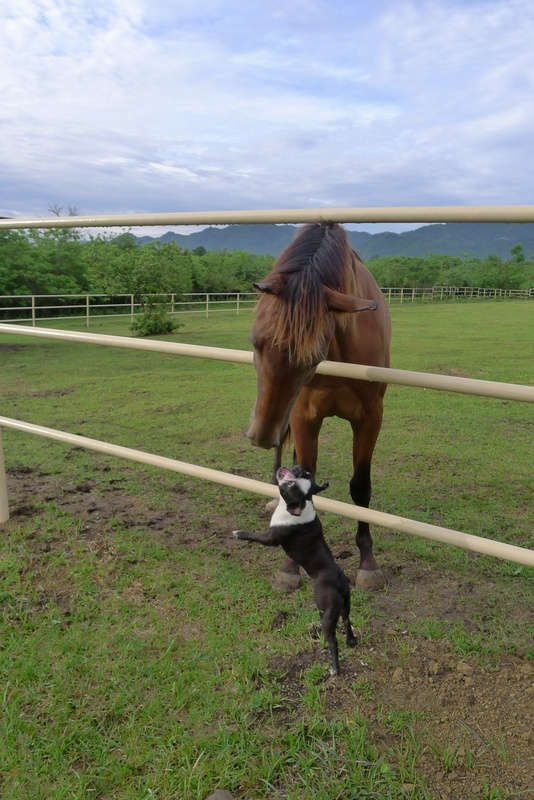 Unlike dogs, horses test the herd pecking order every single day. They will literally try to push you around. The first one who moves, loses! Respect is a big thing among horses. According to my training guru, you get a horse to respect you by “moving his feet forwards, backwards, left and right”. In the early days, I must admit that the horses were better making me move my feet move around! Ah, newbie error! All I wanted in the beginning was a horse I could ride. Then I realized that aside from riding, it would be fun to learn how to take care of and train a horse. Then I found out I would need two horses because horses are herd creatures and need at least one friend. So now we have this little herd going on. It’s much more interesting and challenging that I had expected. And lots of fun! I’m hooked on your blog na! 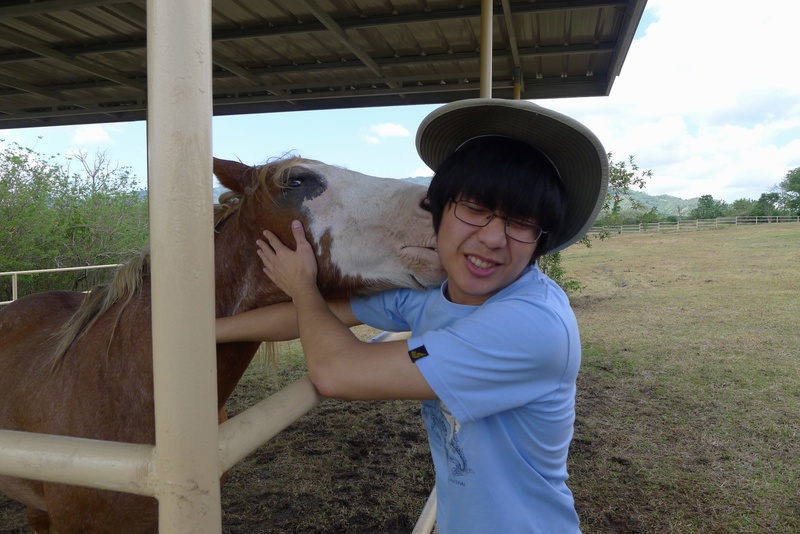 I think Takoy would be more my speed of horse…how did you stop B-man from biting? They okay with the dogs always? Thanks Sands! Takoy is more comfortable to ride right now. He just feels very solid. B-man <– that's cute! He bit me again just the other day while I was grooming him. I think because the previous week, I only went once to the farm. After he did that, I lunged him for a minute to show him that I can make him move his feet. Then he was ok. He's like "Oh yes, you're the boss"! Doing the groundwork with them made a big difference in our relationship! I also feel more comfortable moving them around. The dogs still try to run into their paddock and chase them. Then they get chased back. Still scary to see. So I keep them on leash when I'm working w the horses. for things close to this. i’ll be subscribing your rss so i do not miss the good things! once again, amazing web page please keep this up! Please pardon me if my english is bad. Hi there, I chanced upon your webiste while looking up certain trees. I too am developing a farm in Alitagtag, Batangas. I was just wondering, are your QHs from Marco in Lipa? Who did your paddocks– quite nice, I must say. I am also planning to have paddocks built so no point in reinventing the wheel if someone out there makes them well enough. Hi Michael, thanks for dropping by my site! 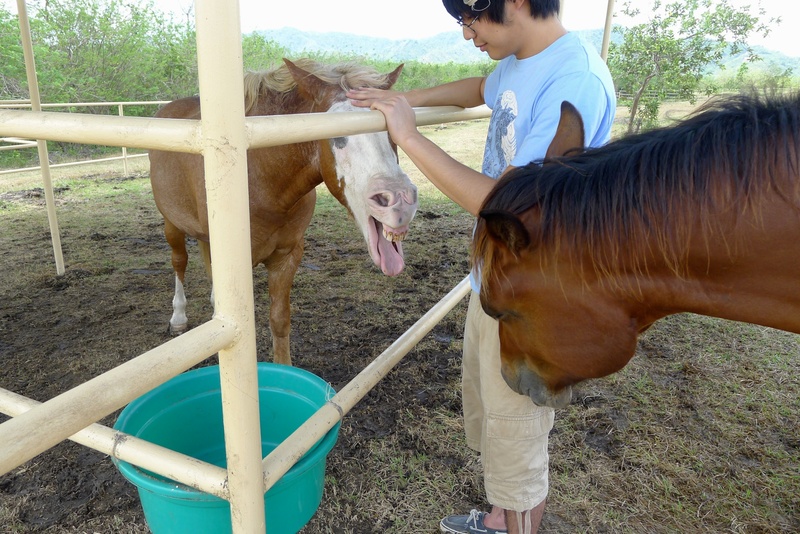 Yes, the horses are from Marco in Lipa. The paddock is from our own design and specs, based on the guidelines in “Horsekeeping on a Small Acreage” by Cherry Hill. We brought in welders from Manila put it together. Later, we realized that the local workers could do it just as well. No need to import workers! So we’ve been using people from the area to do all our other construction, like the horse shed, round pen, and even our stone cottage. Previous Previous post: I’ve Got Worms!